Project Donate – Run, don’t walk! Hi everyone! I am participating in the Project Donate event – all funds donated will go to Unicef for Pakistan Flood Relief. It’s a cause that in my humble opinion has gone under reported, and many life’s are being devastated. It only takes one person to help a good cause, I hope you’ll visit the event. 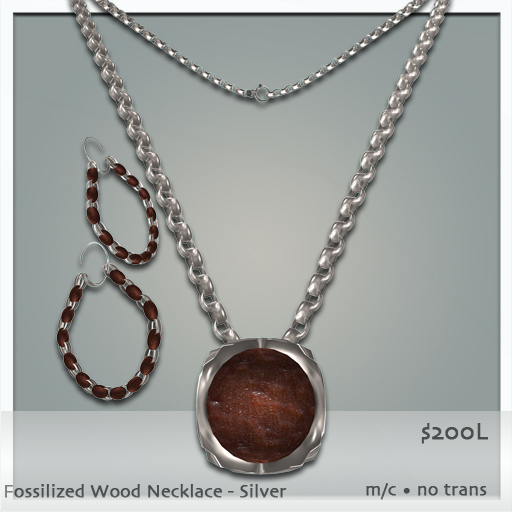 My item for offer is the, ‘fossilized wood’ necklace, which seemed appropriate. If you buy a single 50% of the funds will be donated, if you buy the fatpack, 100% will be donated – why? Cause I want you to buy the fatpack ;-). There are many, many designers participating in this event, which has been generously organized by Truth Hawks of Truth Hair fame. I encourage you to visit and spend some linden. Here’s a teleport to the show. Next Next post: Hump Day Happiness at Dark Mouse Jewelry!